‘Star Wars’-Themed Dodge Muscle Cars Hit Streets of L.A.
A pair of Fiat’s Hellcat muscle cars, painted in the black-and-white uniform of the First Order of Stormtrooper and a Kylo Ren-themed Viper ACR, will tour the streets of Los Angeles. The marketing force behind Star Wars: The Force Awakens is unquestionably with Fiat Chrysler Automobiles. A pair of the carmaker’s Hellcat muscle cars, painted in the black-and-white uniform of the First Order of Stormtrooper and a Kylo Ren-themed Viper ACR, will tour the streets of Los Angeles from Dec 11-14 as part of the unrelenting marketing juggernaut behind the seventh installment in the Star Wars franchise. 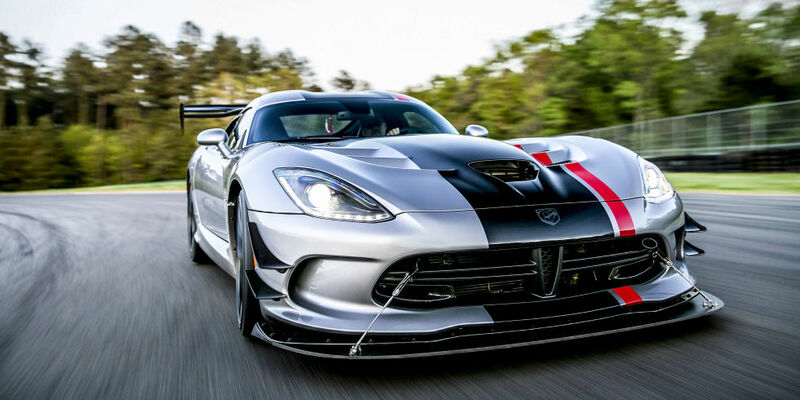 Fiat Chrysler is unsurprisingly encouraging Star Wars fans to post photos of themselves mugging in front of the Hellcats and Viper on their personal social media pages, which FCA will repost to Dodge’s Facebook and Instagram. Such fan-focused social media crowdsourcing is becoming an increasingly popular — and cost effective — strategy to co-promote movies and products. The partnership between LucasFilm, producer of the Star Wars franchise, and Fiat Chrysler has already yielded a Stormtrooper-painted Fiat 500e, which debuted at the Los Angeles Auto Show in November. Star Wars: The Force Awakens opens on Dec. 18. Not unlike the kid who eats all of his Halloween candy promptly on the morning of Nov. 1, I recently decided that a nice 501-mile drive — the upper limit on our press evaluation automobiles — might be a good, one-time trial for the 2015 Dodge Charger SXT Plus, in AWD form. And from the Front Range, my mapping suggested that I could get all the way to the Sand Creek Massacre National Historic Site, located within spitting distance of the Kansas border, and Bent’s Old Fort, another national historic attraction, and get back, all within 500 miles. Provided you’re willing to second-guess Google Earth or Dodge’s own navigation system and improvise with a scenic, grasshopper-laden jaunt across gravel roads south of Kit Carson to shorten the route, it is indeed possible — and the austere but impactful Sand Creek site is certainly worth the long, long drive. Austere but impactful might also describe a vehicle that, while more powerful than the most basic Charger build, does indeed pale in comparison to the superhero-strength 707-horsepower Hellcat variation. The SXT Plus takes the 3.6-liter V6, the simplest of Charger’s many, many choices, and bumps it up to a rounded 300 horsepower, from 292. 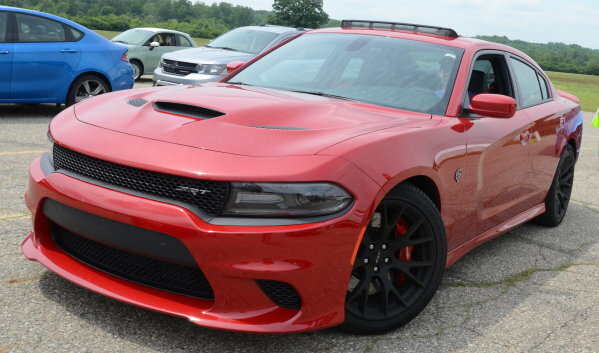 Combine that with full-time automatic AWD — which mostly defers to RWD format in summertime use — and you actually have a better setup than many of the other V6 Charger cop cars on the road, unless they’ve ordered the 370-HP Hemi V8 version. Unlike those Hemis, the 3.6 here got me a verified 32 mpg — even with long stretches at 75 mph — though the window sticker says 27 highway. That is indeed pretty decent. My test machine started at just under $33,000 but had a pretty substantial array of upgrades totaling more than $5,000, including blacked-out grille inserts, deep-dish chrome wheels, LED running lights and high-output headlamps, a body-colored spoiler and chrome exhaust tips; on the inside, the extras included two-tone perforated leather seating with highlight stitching, some intriguing rubbery carbon-fiber-styled plates around the shiftgate and console video screen, the Beats stereo system with 10 speakers and 552 watts and even heated rear seating. A single 11-hour hump in the cockpit did indeed reveal the pleasant but occasionally industrial Charger to be a competent cruiser, a four-door machine that’s infinitely easier than the platform-sharing Challenger for daily use. The open road, a great lot of it, also demonstrated the value and utility of the eight-speed TorqueFlite automatic transmission, which felt as solid and intelligent as any unit in an import — a vast difference from the hunting and poking many folks are experiencing in the nine-speed auto Chrysler has offered in many of its other smaller vehicles. Should you feel the need to be invasive, you can snick off gear changes with the thumb shifters on the very large wheel or tap the shift lever, without any hesitation on the transmission’s part. Economies of scale accounted for, 300 horsepower is also not so bad, with safe and steady speeds above highway limits available, in short notice. How the charming but not overly sophisticated chassis would respond to 707 horsepower, I am still waiting to find out. AWD also kept things nicely grounded during my gravel bits, no tail wagging of any kind. What I did appreciate was Charger’s more elevated glass greenhouse, which — unlike Challenger, Mustang or Camaro — provides easy, safe and ample 360-degree visibility, even in the slightly tapered rear windows. But some stuff drove me crazy. Pillowy as they are, the seats all feature what felt like a foam-filled pizza box for a mid-back cushion, a lumpy and static block that never really got comfortable, despite good side bolstering. Rear seating feels the same on the lower back, but is tall, deep and squishy on the bottom. And the ergonomics still never worked for me — even with the seats in normal driving distance from the wheel, I could not comfortably reach and close the doors, resorting to a pathetic grab at the flappy plastic around the bottle holders to slam them shut. Instrumentation is clear and brilliant but the mid-cluster video display, common to many new Chrysler family products, has seven sub-screens to scroll through to get mileage and digital speedometer displays, and starts to look like the rolling cherries on a video slot machine once you’ve done it for 11 hours in a row. There’s also a rubbery plainness to the dash, with those large, deep, sink-like spaces and their chrome edges rendering the design firmly underwhelming. But some may really love that kind of thing — and be truly delighted by bits like the pushbutton starter or the Dodge Brothers details in the not-quite-iPhone-sized tray on the center console.